Happy Monday everyone! Today I’m teaming up with J.Jill to talk about bringing inspiration into your everyday routine – and highlighting a few of my favorites from their new April collection! One of my goals for 2018 is to invest a bit more time into myself. I’ve started carving a day out of my week to meet a friend (or someone new!) 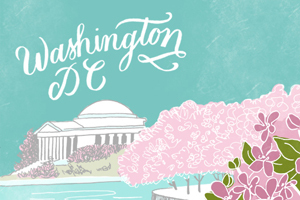 at a coffee shop or café, explore different shops and neighborhoods in DC. The new April collection from J.Jill is full of beautiful, comfortable pieces that can travel with me throughout my day! It can be so easy to fall into a style rut as a mom. My fellow moms will know the drill: Get the kids up, dressed, and fed in the morning. Get them to school or daycare. Try to get as much work and/or errands done during the day before it’s time to pick the kids up from school. Get home and make dinner. Bath and bedtime. Maybe a little bit more work before sleep. Repeat, repeat, repeat. Other things fell down to the bottom of the priority list. Things like getting together with friends, exploring this amazing city that I live in, connecting with fellow creatives here in DC, or taking care of myself and making sure I look and feel my best. All really important, but super easy to set aside when life gets busy. The J.Jill April collection is the perfect combination of chic and easy style—all of which are easy for me to keep up with in my busy day-to-day. When I worked at the State Department, I wore a typical professional wardrobe of suits and separates. Now that I’m a mom and I work from home running a creative business, I need a wardrobe that is comfortable and flexible, but still cute and well-designed. Design is definitely the one thing I won’t sacrifice when it comes to my wardrobe! I need pieces that work for the entire day, from school drop off in the morning through a lunch date with a friend and afternoon errands. I also prefer classic pieces in quality fabric that I know will work in multiple seasons, then I add color and texture through accessories and jewelry. Here’s what I chose from the J.Jill April Collection, and how I styled the different pieces! This linen button-back tank is so comfortable – it also comes in a beautiful pale pink! It’s the perfect top that can be dressed up or down! I’m loving the asymmetrical hem on this flowy tab-sleeve top. The moss green color is definitely having a moment this season, and it’s so cute paired with a chunky necklace. This linen tie-waist dress has a super flattering fit and made of a beautiful lightweight linen. I love the idea of layering it with a cardigan or denim jacket (which should be a staple in every wardrobe) in the spring, then just wearing it on its own in the summer. I love the fringe trim on this denim jacket — I will definitely live in this piece for seasons to come! When you work from home, it can be super easy to get distracted by everyday tasks. I’ve started going to a different coffee shop in DC at least once a week to just clear my mind and jot a few ideas down in a notebook. I don’t bring my laptop and I try not to look at my phone, I just focus on all the ideas floating around in my head and put them down on paper! When I first moved to DC fifteen years ago, it wasn’t known for being a super creative town. Luckily, that has changed a lot in the last few years, and we have more creative people living in DC than ever before! I make an effort to schedule lunch dates with friends at least once a month, which with two small kids is easier than meeting for dinner or drinks in the evening. I’ve also been trying to reach out to creative people in the area that I follow on Instagram but haven’t yet had the chance to meet in real life. I always come away from these in-person get togethers feeling so inspired! It’s no secret that I love flowers, and I love to garden. My backyard is my happy place, especially in the spring and summer when everything is blooming! And spring in DC is a glorious thing, with cherry blossoms, daffodils, tulips, lilacs, and peonies later in the season. I always feel so inspired by nature and flowers. I love visiting the outdoor public gardens in the DC area, like Dumbarton Oaks Garden, the Arboretum, Green Spring Garden, and Meadowlark Botanical Garden. I also spend quite a bit of time at our local nurseries picking out annuals for my flower beds and containers. Plant shopping is my favorite special treat at the end of a busy week. How do you find inspiration in your everyday routine? And fellow moms, how do you find time for yourself in a busy week? I’d love your tips! Let me know in the comments! This post was created in partnership with J.Jill. All content and opinions are my own. Thank you for supporting the sponsors that make Oh So Beautiful Paper possible!